Shen Dance & Friends:The Ladies dancing for the runners/walkers! Click on picture to see more shots! HPIM4783.JPG, originally uploaded by campdancer2000. Sunday morning, bright and early, with the sun shining off of the sparkles and glitter of the dancers as they lined the Rideau Canal to welcome to participants of the ING race weekend! 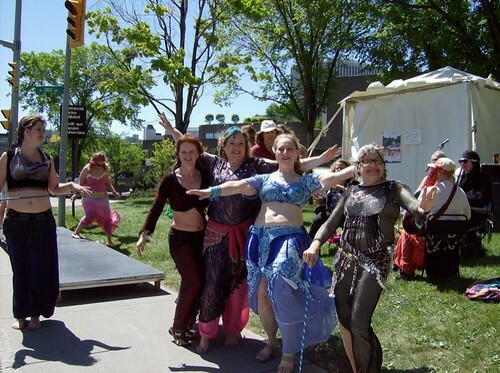 GeeGee Robinson is one of the matriarchs of our belly dance community here in Ottawa and has led the Shen Dancers as they perform and share their love of belly dance, middle eastern dance, Raks Sharki, whatever name you would like to call it. Along with many of her former students, and friends in our dance community, they created a fun and joyful atmosphere with music, drums, zills and cane dancing! I was glad to be able to pop by to take some pictures of them – deciding that two dance events in one weekend was enough for me. I had been at the Indo-Caribbean Cultural Celebration performing on Saturday evening, and then was heading off to dance and teach for a friend’s party around lunch time. So, I offered some moral support and documentary assistance to the group of lovelies! Congrats ladies – there were a lot of smiling faces as they passed you by!